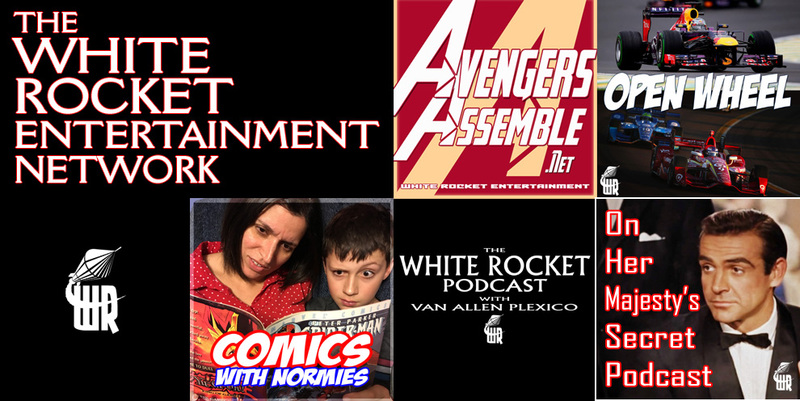 The White Rocket Entertainment Network includes the flagship program, "The White Rocket Podcast," hosted by Van Allen Plexico, with interviews, movie/book/TV/comics reviews, and convention panel discussions from around the country. Also in the White Rocket Entertainment feed you will find "Avengers Assemble" (discussion of the Avengers comics and the Marvel Cinematic Universe, by the Jarvis Heads of AvengersAssemble.net), "Comics with Normies" (Jarrod Alberich discusses a random comic with a non-comics-reader), and "Open Wheel" (Van Allen Plexico and Alan J. Porter cover Formula 1 and IndyCar racing). Other programs that are part of this network but which have their own separate podcast feeds are the "AU Wishbone Podcast" (Auburn football discussion with Van Allen Plexico and John Ringer) and "On Her Majesty's Secret Podcast" (James Bond discussion and interviews by a number of Bond experts and fans).